Charlie Capaci, PA-C is a board certified Physician Assistant. Charlie received his Bachelor of Science in Nutritional Bioscience from the Pennsylvania State University in 2008. He then obtained his Master of Medical Science degree upon completion of the physician assistant program at Arcadia University in 2010. He is an active member of the American Academy of Physician Assistants and the Association of Plastic Surgery Physician Assistants. He has been published in the Emergency Medical Journal. 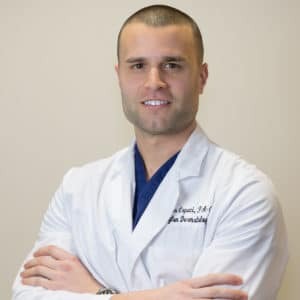 Prior to joining Abington Dermatology Associates, Charlie practiced in a busy outpatient dermatology and plastic surgery practice in Wyomissing, PA. Charlie provides treatment for all dermatologic concerns. When not working, Charlie enjoys playing sports, exercising, and spending time with his family.